This is where you want to be! Why you came to Kauai, Right on the ocean. Heated pool, AC, Boutique resort. When you walk in the door and look through the living room all you see is ocean beyond.Then you hear it.The slate floor feels cool on your feet as you walk in.To your left is the guest room with queen bed.It's the quiet room facing onto the mountains.The living room includes a comfortable dining area and leads to a convenient fully furnished kitchen and lanai.To the right of the living area is a hall leading to the master with private bath and large closet and second guest room with twin beds (convertible to a king) that overlooks the ocean where you have the sound of the waves below and panoramic sights out over the water. Spending time in the lanai is an ocean watchers dream.Looking south the waves crash on the cliffs,count turtles in the water below(the record is 24 in a single count),dolphins swim by jumping out of the water and spinning in the air,whales swim by and breach all around. Three bedroom condos on the ocean are very rare, but to have one that is air conditioned is really unique. Many people enjoy the sublimity of the trade winds for cooling. If you need it, though, the condo is air conditioned! We learned early on that regular outdoor furniture put you at a level looking right into the railing so we brought in bistro chairs and tables.Now it feels like sitting in the director's chair watching a wonderful scene unfold across the ocean. Walk the short path along the ocean to Brennecke's Beach and Poipu Beach Park for snorkeling and fun on the sand.Turtles frequent the waters along the walk. This is a small property with only 39 units. No crowds here! The only heated pool, right on the ocean, is great for relaxing, visiting and sunsets. The top floor location(only one flight up) is shared by only one other unit providing privacy and a commanding view . From that vantage you can look directly down into the ocean and watch the turtles swim and feed. Inside there is plenty of room for up to six guests to relax. Just a couple block stroll along the shore brings you to Poipu Beach State Park with good beaches and lawns to relax and play.There are many good restaurants within walking distance or a couple minute drive. The guest book is loaded with lots of good ideas from past visitors. What a beautiful spot! We practically lived on the balcony, saw turtles and whales everyday. The condo was very clean, comfy and beautifully decorated. We were 4 adults and had plenty of room. The kitchen was small, but nicely updated and very functional. Location is perfect, easy walk to beach, surf shop and Brennecke's restaurant. 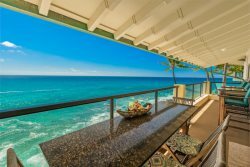 Stay in this condo for the BEST ocean views in Hawaii!! If you are looking for amazing views--pick this condo!! The ocean is literally right below your deck with stunning views of crashing waves, turtles and turquoise seas to feast your eyes on, The extra tall chairs on the deck make it feel like you are almost on top of the water! I don't think there could be a condo that feels more like you are ON the water than this one! We sat on the deck for hours just soaking it all in. The condo is well appointed and stocked with all the comforts of home (and very comfy beds). The rock flooring and furnishings are very tasteful and will make you feel right at home for your tropical vacation. The staff at the complex is very welcoming, friendly and helpful. The gorgeous Poipu beaches are a very short walk on a nice path along the ocean. This location is very central and provides a good home base for exploring the North, East and West coasts of Kauai. We hope you enjoy this condo and view as much as we did. It's simply incredible!! We hope to come back soon. Loved everything about this property! You really can sit on the lanai and watch sea turtles and enjoy crashing waves. VERY convenient to everything and walking distance to anything. Clean and updated inside. Would stay here again in a heartbeat!!!! Waking up on the Lanai with the sea breeze & coffee in the morning was so invigorating. Centrally located, we were abe to go exploring around the island & be back by dinner. Full kichen to be able to fix yourself whatever you pick up from the many farmers markets during the day. Very near many restaurants as well, to try the hawaiian cuisine. A short stroll to the beach to swim, snorkel or play is so close & the views are amazing. Relaxing in the evening with Smoothies made with fresh papaya, mango & pineapple while melting into the sunsets is the BEST! This is a great place & would be wonderful for family reunion with 3 bedrooms. Everyone is so kind & helpful. The highlight was that we must have seen a whale jump every minute....amazing. This was our first visit to Hawaii and we chose Kauai to experience a holiday immersed in nature. Poipu Shores is in a fantastic location and the views from the lanai are second to none with a bird's eye ocean view of all the amazing wildlife. The condo is clean and comfortable and has everything one needs to make for a relaxing holiday. This property is not advertised as a Deluxe; we understand other condos have been upgraded, so we were not expecting 5 star luxury and yet, this did not detract from our wonderful experience in any way. All the staff were very helpful and pleasant and we certainly experienced the "Spirit of Aloha" staying here. We hope to return again soon. Wonderful location and condo - Definite "YES"
The stay in this unit at Poipu Shores was exceptional. Great location to walk to the beach in a few minutes or just lounge in the pool. The location on the upper floor gave us wonderful views of the ocean (which you can practically feel the spray coming over the rocks) Large lanai to just sit and relax on. The 3 bedrooms were great to spread out. We didn't want to leave and would definitely stay here again. Unit has free parking for one car..
One of the largest lanais on the property,dining table and chairs,bistro tables and captains chairs.Top level location allows viewing down into the water!